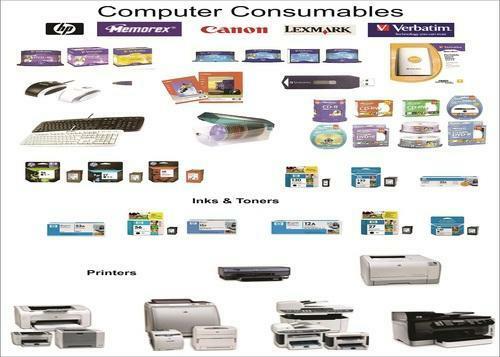 We are engaged in offering a qualitative range of Computer Consumables to our clients. We procure these consumables from leading companies like HP, Samsung, Canon, Brother, Lenovo, Lexmark, Sony, Moserbaer, Compaq, Dell and etc. All these computer consumables are completely reliable and provide an error free performance. These consumables are also widely demanded in the markets. We take this opportunity to introduce ourselves as premier office suppliers. Covering entire range of stationery items, House Keeping Materials, printer Cartridges and also pantry Items at very competitive rate. Thus providing all the office needs under one roof. We aim to replicate its success across more esteemed clients and become a recognized brand for office supplies. With strategic support from leading manufacturers HP, Lexmark, 3m, Panasonic, Camel, Reynolds, Omega, Ajs, Njs, Solo, Corporate, Jk Copier, Bilt, Kleanwell, Greengami, Johnson diversy, Reckitt Benckiser, Hindustan Unilever, Gala, Kimberly Clark, Padamji, Schevaran etc... we are ready to grow multifold in our services and reach in the coming days.In our pursuit to give complete office solutions to the customer. We are also introducing “IN HOUSE STORE MANAGEMENT” with this customer will be able to procure any products of his choice instantly. We offer a bouquet of value additions to our esteemed customer like you. We will be most obliged if you could give us an appointment, so that we could discuss further to customize your office needs in the most innovative way.